Help the little penguin find his way back home. The penguin will be flying very fast but there are also obstacles like birds, plane etc in his way. So be very careful to not collide with these things. Your job is to help the penguin go home. Just tap to start flying and hold to move the penguin up and down. This is a super exciting penguin flying game for all ages... kids and adults! 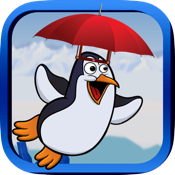 Download this game right now and enjoy penguin flying!